What with our long runoff, the Feds re-writing the floodplain, Whitefish agreeing to re-start its vest-pocket hydro plant, Columbia Falls Aluminum Company talks with Bonneville Power, Judge James Redden in Portland slapping down (yet again) agency salmon plans to the glee of Greens, Fort Peck running full bore over the spillway - there's lots of dam thinking to do these days. 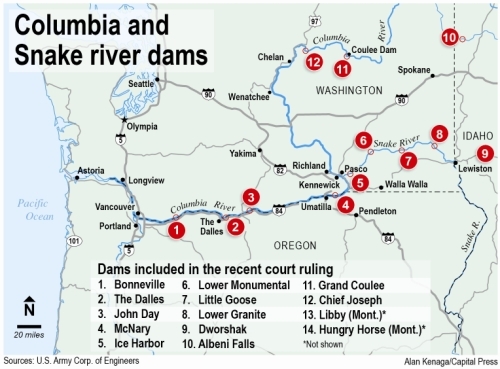 I've been thinking hardest about Judge Redden's ruling, which re-ignited speculation of whether or not the Endangered Species Act will force the removal of, at a minimum, the four "Lower Snake River" dams in the so-called Columbia River "hydrosystem." The plaintiff group American Rivers (AR, known not just for litigation, but its "Most Endangered Rivers" crisis list) seems to hope so. Shortly after Redden's ruling, AR spokesman Brett Swift again reiterated the AR position that "science points to the removal of the four dams [. . .] as the centerpiece of [. . .] salmon recovery." Blather? Not necessarily - President Barack Obama just nominated American Rivers' 16-year president, Rebecca Wodder, to become Interior assistant secretary - overseeing the U.S. Fish and Wildlife Service (which has ESA authority) and Park Service. If Wodder is confirmed by the Senate (hopefully not), expect a lot more dam thinking. We used to do a lot of dam thinking - and much of it was pretty poor dam thinking in terms of the costs and benefits of putting dams in - I would hope we have our dam thinking straight on the costs/benefits of taking them out. So far, I'm not impressed. Over on Washington's Olympic Peninsula, demolition is underway on two Elwha River dams (Glines Canyon and Elwha), which will end up costing at least $325 million (of our grandkids' money). Never mind the 19 megawatts of power needing replacement . . . Bonneville Power is doing so from other dams on its grid. A wind replacement would cost no less than $71 million, plus the fans would scratch 2,815 acres of habitat if located in prairie-chicken country. Then there's the Snake, the so-called "centerpiece" of the dam-blower campaign. Several years ago, I suffered through the Army Corps of Engineers environmental impact statement (EIS) analyzing Snake dam removal. Replacement power would carry an annualized tag of $241 million to $291 million, while fish returns would show a net increase of 47,461 fish per year after removal, enabling an increased yearly tribal harvest of 1.7 million pounds. On page 368 of the EIS's appendix, the Corps calculated the 100-year-annualized cost per fish at $8,000 - per 30 pounds of recoverable meat, $267 per pound - in 2000 money. Now, a few years prior, I'd enjoyed a nice visit across from Wishram with a Warm Springs tribal member - who was selling fresh salmon off his tailgate for $8 a pound. Sure, salmon are a Pacific Northwest icon, "priceless," but do the dam math . . .
What about our very own Hungry Horse Dam? Now, I'd rather the South Fork was full of trees instead of water. Can you imagine the sweetheart deals cut by Anaconda chairman Cornelius "Con" Kelley to bring Anaconda Aluminum to Columbia Falls, or the logrolling that funded Libby Dam? But it's foolish not to respect what Hungry Horse made - and makes - possible. Pork or not, it was an amazing gift to Northwest Montana that keeps on giving. I remember the archway on Nucleus Avenue that proudly displayed the slogan "Industrial Hub of the Flathead Valley," justifiably so. For decades, hundreds of Flathead folks made solid union-scale wages, bought and paid for homes, sent their kids to college, the whole "middle class" nine yards - all while producing a commodity vital to America, from beer cans on up to spacecraft. Competing demands and pricing for power from other, "higher value" uses including residential and other forms of manufacturing have forced CFAC to the bottom of the power chain - along with the rest of the Northwest's aluminum smelters. But that doesn't make Hungry Horse Dam less critical to us today. All of us here derive most, if not all, our electricity from hydropower.